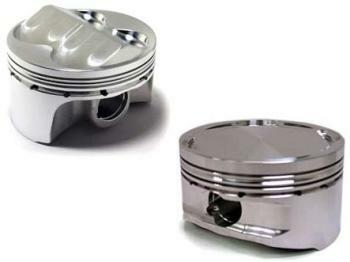 CP stocking pistons are made from premium 2618 aluminum forgings that are application specific. CP pistons feature CNC craftsmanship, made to only the highest tolerances, made using the highest quality materials. Each set includes pistons, 5100 series alloy wrist pins (9310 pin upgrade available for high HP use), ring pack with ductile iron plasma top rings, tapered second rings, low tension oil rings and spiral locks. Most shelf units are in stock and ready to ship. CP custom pistons are made to order with 2618 aluminum forgings that are application specific. Choose any desired bore size and compression ratio, as well as added features like 9310 alloy wrist pin upgrade (5100 series is standard), anti-detonation grooves, lateral and/or vertical gas ports, and chamfered pin boss. All customs include premium ring pack with ductile iron plasma top rings, tapered second rings, low tension oil rings and spiral locks.